Contemporary landscape design in San Diego seems to be on the rise. Perhaps in response to the current building boom of ultra-modern row houses and multi-family dwellings on in fill lots throughout the city. Or, it might also just be the latest trend in outdoor spaces. People live busy lives, they need order, clean lines, minimalism in their outdoor environments. Many newer homes are built on a small lot and the rectangular element of the lot often lends themselves to this contemporary movement. 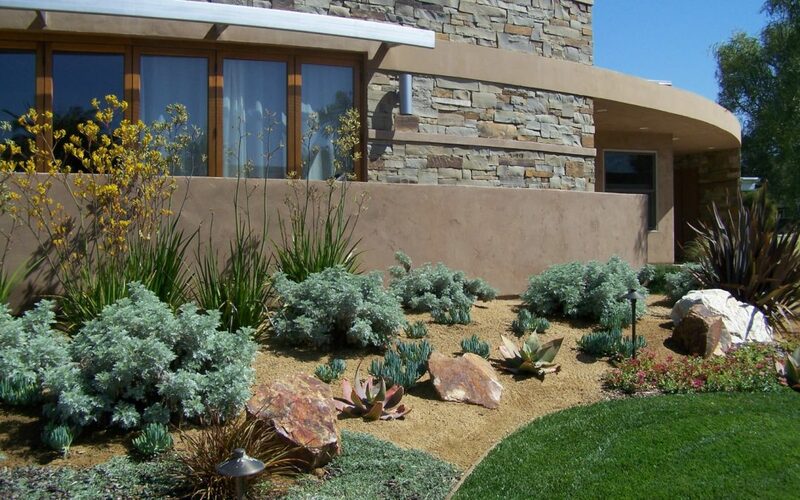 Most typically, contemporary landscape design in San Diego includes a greater emphasis on the hardscape. Concrete, either plain gray or colored is the most commonly used material. However, we are now seeing newer products such as liner pavers or other paving stones with rectangular shapes that fit well into this theme. These landscapes typically include the use of gravel or cobble (rounded stones) added for interest and texture between squares of concrete. Along with concrete, other elements that are a bit more unique are the use of cor-ten steel. Whether as a water feature or a planter-retaining element, the rusted surface offers some relief from the common stucco or block walls. And to soften these hard elements, wood is used for decks, fencing, gates and the like. Water features themselves may be custom built or pre-cast. Most will have a strong visual appeal and serve as focal point. Water may be a simple cascade from a weir or from the top of a wall falling in a sheet. Geometric elements of the square, rectangle and at time a circle may all be interwoven into a design for an extremely appealing visual. These shapes can be rather bold as the element of line is very strong in contemporary landscape design in San Diego and elsewhere. Overall, the aspect of simplicity is a key factor in the design of this type of landscape. The softscape can be designed to be in a geometric pattern, i.e. ornamental grasses or smaller succulents, or it can be more natural (see photo at right) to compliment the strong lines of the architecture. Plants themselves can offer interest in simply their forms, such as Agave, Kangaroo Paws, New Zealand Flax or Cordyline. These type of plants have a consistent form or geometry of their own. Repeating these plant forms in the landscape reinforce the strong statement of the architecture. One does not need to have an ultra-modern house to enjoy a contemporary landscape plan. Of course landscape lighting will greatly enhance these elements in a contemporary landscape design in San Diego. The uses of up lighting of plant material or washing a wall in light are the most typical. Many lighting manufacturers offer a good range of more modern looking fixtures. A few good references for other details of this latest crazy with contemporary elements include, “the Modern Collection” from Eldorado stone. Also see the expanded line of rectangular 12” x 24” Plaza Stone pavers from Orco Block. Creative Mines have some wonderful new precast stone facing materials with both stone and wood grain effects. And Stepstone, Inc. has now included CalArch Narrow Modular pavers in varying sizes. Contact Letz Design Landscape for more ideas on enjoying this intriguing design trend.